ICSE, ISC Minimum Passing Marks Dropped by the Council for the Indian School Certificate Examinations (CISCE). These changes will be applicable from the 2019 academic session. These changes have been done to bring the uniformity among different boards in the country. Inter Board Working Group (IBWG) made many recommendations in which it was suggested that all the boards in the country should have same pass mark criteria. On account of these suggestions, the council decided o change its pass mark criteria. 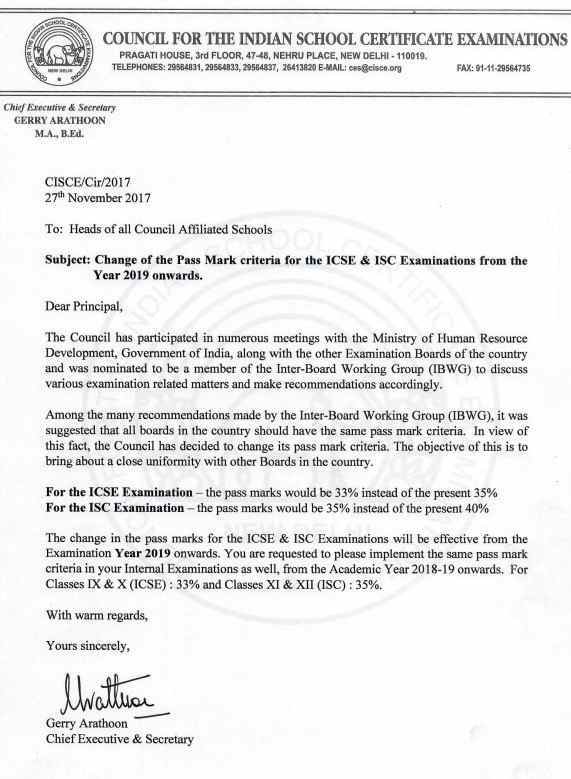 Now the pass percentage has been reduced from 35% to 33% for ICSE Examinations and 40% to35 % for ISC Examinations. The same will be applicable for classes 9th and 11th as well, class 9th passing percentage will be 33% and class 11th passing percentage will be 35% from the examination year 2019. Gerry Arathoon, chief executive of CISCE said that objective of taking such step was to bring close uniformity with other boards in the county. He also added that these changes were decided following several meetings with the ministry of human resources and development along with other boards of the country. He said that these changes would be effective from next academic session 2019 and requested all the schools to implement these criteria for the next examination year. This would be implemented in internal as well as external examinations. Get more Education News Here.